The Industrial commodity inspection article provides you with information about second and third party inspection activities, which are done to confirm that delivered commodities, have the same specifications stated in the purchase order. The scope of work for commodity inspection is very similar to the pre-shipment inspection. Pre-shipment inspection must be done before shipment, but in inspection of commodities the buyer and seller might agree to inspect the commodity in the destination place or country. For more details, review the Pre-Shipment Inspection article. Based on the agreement between the buyer and seller, the commodity might be inspected by the buyer's own inspector or independent third party inspector. When a commodity inspected by buyer's own employee then it is a second party inspection. The proforma invoice, purchase order, letter of credit, commodity specification and drawing must be reviewed by the inspector before physical inspection of commodity. The third party inspector must provide an inspection visit report to the purchaser and issue an inspection release note if the inspection result was satisfactory. By receiving the release note, the seller can organize for shipment, and it is necessary to notify the inspector of the shipment date advance (if loading inspection is in the scope of inspection). If the purchase fund is transferred through the letter of credit, then the Third Party Inspection Company must issue an inspection certificate. The inspection certificate is almost always issued after the shipment of the commodity. Several documents must be submitted by the buyer to the commodity inspection company for issuing the inspection certificate including the bill of lading, certificate of origin and signed and approved packing list. For more details, review the Certificate of Inspection article. But if the commodity value is paid with T/T (Telegraphic Transfer), which is the same as wire transfer, then these formalities are not necessary. But this is done only for small purchases or when the buyer and seller trust each other and do not want to spend lots of time opening the LC and following the procedures. In the T/T payment method, the inspection certificate is not necessary and the inspection report and release note might be enough for the buyer. The scope of inspection depends on the buyer. 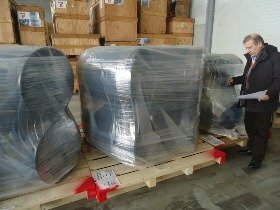 They may order a third party inspection company for 1 man-day and request for visual inspection, quantity check, packing and marking inspection or order several days to witness some tests. For example, assume a buyer wants to purchase 150 water pumps from a pump manufacturer or its distributor. Then the buyer can hire a third party inspection agency for 1 day just to make a document review of the drawings, test reports, material certificates and also make a visual inspection, and check packing and marking control. Or the buyer can hire a third party inspection agency for 5 man-days and ask the inspector to witness all pump performance tests and also visual, packing and marking inspection. Definitely, the inspection costs will be higher in the second option, but the risk of receiving the non-conforming pumps will be lower. Purchasers must optimize the cost of inspection and the scope of work. In the above example, in the second option, the third party inspection company has made a choice for shop inspection as well as pre-shipment inspection or goods inspection. For more supplementary information in this subject, you may review the Commodity Inspection Services article.